I bake bread more often than I tell you about. Usually, I use one of a few standard recipes. I gathered a few bread books, but I’m not good at using them. I adore photos from Tartine Bread and I even challenged myself to try a recipe from it a few times, but Tomek wasn’t too happy with a bread dough all over the kitchen. That was a while ago, so maybe I should try again. Exceptional Breads: Baker & Spice – I usually flick through it, find a nice recipe, then learn I don’t have enough time to make it. I tried one or two recipes. I will organize myself one day. 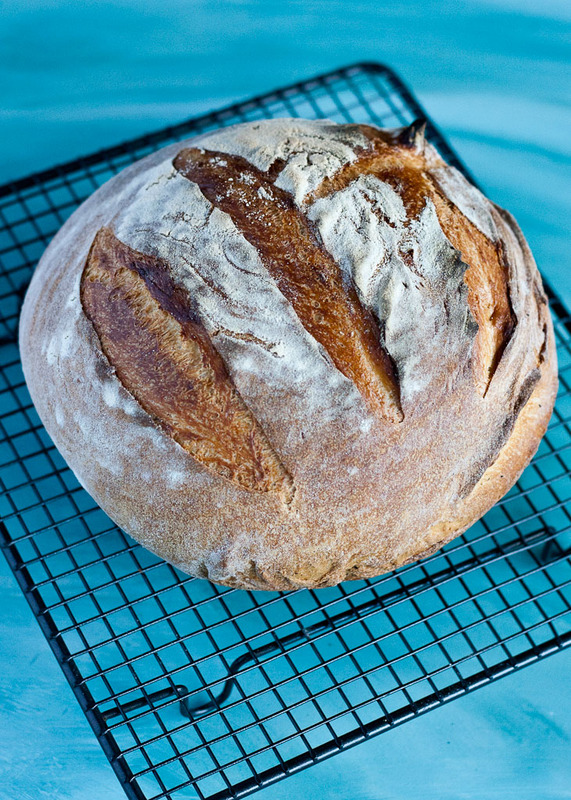 On my wishlist there is Brilliant Bread, but I must deserve it first, so maybe a little gift after holidays? So lately my last resort bread book is actually 100 Great Breads, the recipes are are not too fancy, mostly good, simple, reliable, yeast loaves of bread that you can make in 2-3 hours without unnecessary fuss. This crusty cob is a perfect example. It is so easy to slice, just let it cool properly. Put the flour, salt, yeast, and butter in a large bowl. Add almost all the water and mix it. Add remaining water and knead it on a floured surface until dough is smooth and elastic (about 10 minutes). You can use a stand mixer as well. Put the dough into the lightly oiled bowl, cover it with a cling film and leave to rest for 2 hours or until it has doubled in size. Punch the dough to deflate and form it into the ball and put into the floured basket or a bowl covered with floured tea towel. Leave it for an hour to rise. Put the cast iron pan into the oven and heat it to 240°C. Put the risen dough into the heated pan. Cut it a few time with a sharp knife at the top. Cool it down before slicing. Posted in Breads and tagged yeast, yeast breads. Bookmark the permalink. What a beautiful artisan cob! Love the golden brown crust a lot!